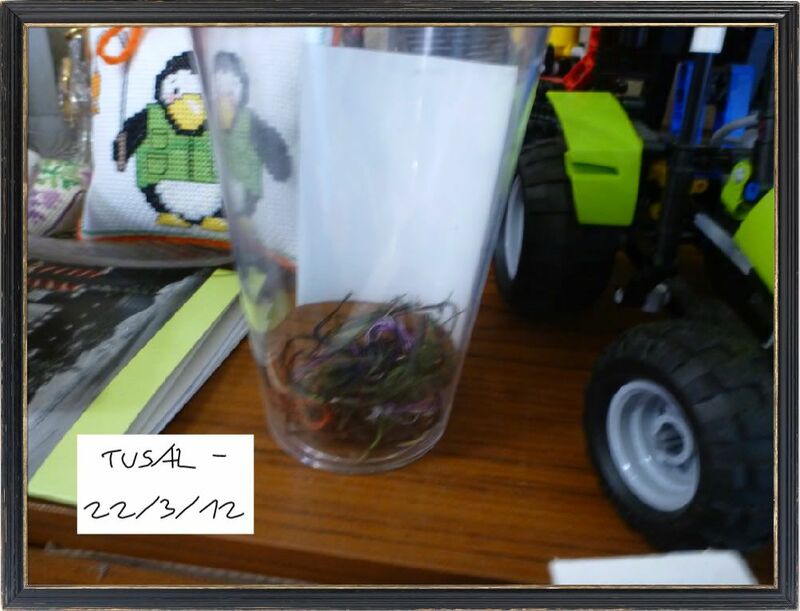 So I am a week late with my TUSAL and it's really boring this month. It is just afternoon tea with a couple of bits of purple mixed in. Lots of green and brown and lots of black! But I have got some stitching updates. 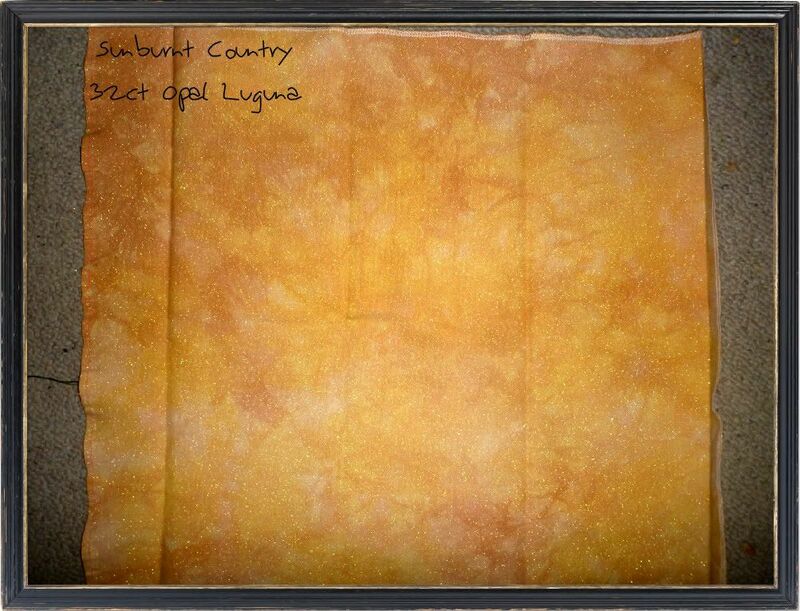 I got a package in the mail this past week :D I bought some fabric from Colours of The Outback. A lady who hand dyes her own fabrics over in perth. 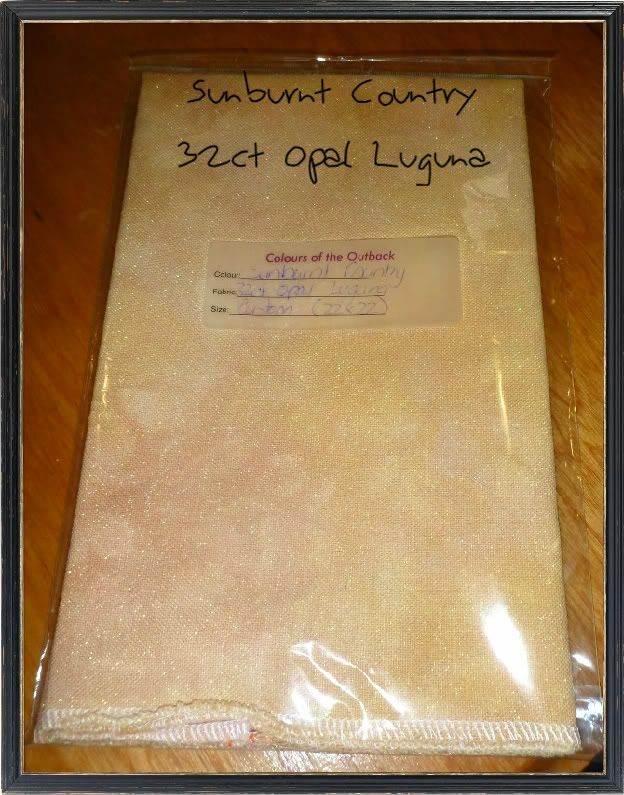 I bought a fabric called sunburnt country in 32ct opal luguna :D It is stunning! It arrived in a lovely envelope and I was so excited! Now I couldn't really get an accurate photo of the colour. The top one is too dark and the bottom one is too washed out but it gives you an idea of what it looks like. So much colour and it all sparkles. 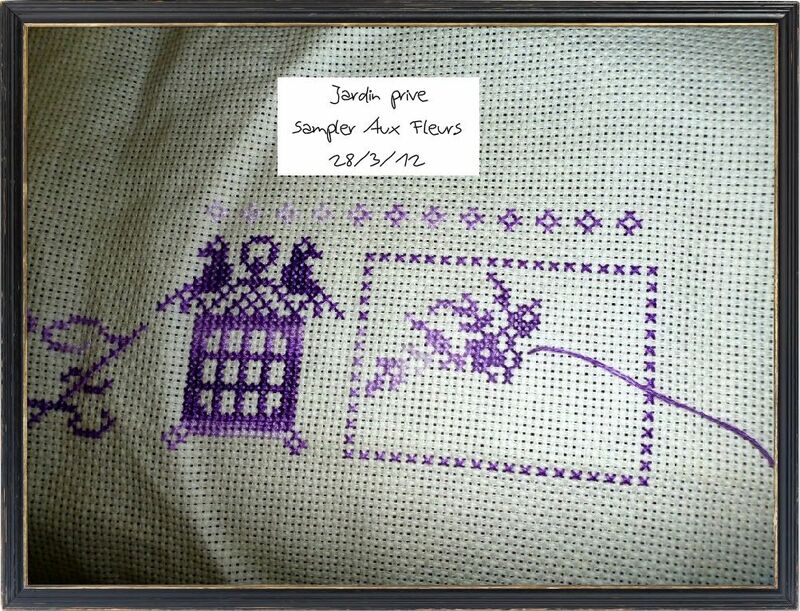 I can't wait to start stitching on it but it will have to wait until after I finish Jardin Prive. Speaking of which I have made some progress... not much because I had to go backwards.The little row of circly things across the top of these two motifs was very easy to do BUT the pattern didn't have them at regular intervals. it had a random 3 space in the middle which I didn't realise was there. So I based the right motif on the border above and you can see my problem? Basically out came the 2nd motif which was finish and I recounted it to be correct. I left the top part as is because I wanted it to be even not uneven. But I know to count the whole motif from now on! I really haven't done much on this piece. 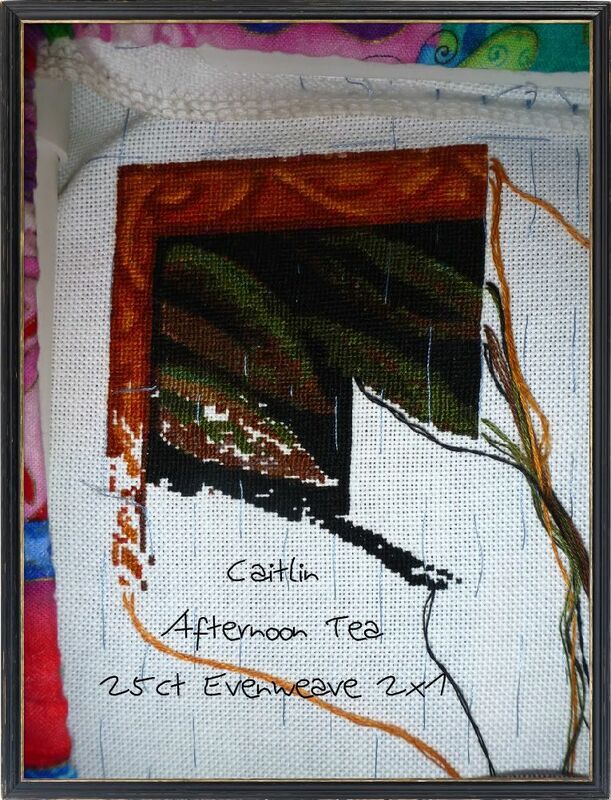 And Afternoon Tea :D Well I did manage a bit and almost finished another leaf. We made an offer on a house today so we shall see how that pans out in the next couple of weeks. I will keep you updated. I am really hoping we can come to some sort of deal! Well my boss has stuffed it up again. I found out when searching for loan information that I haven't been paid super at all! He hasn't paid me anything since I started working for him when I found that out I talked to mum and she hasn't been paid super and nor has my friend in admin. So that is 3 people who haven't received super from him which makes me worry! Where has it been paid to? Life is going to change drastically over the next couple of months. If we do get this house we will need to move in but even more importantly we will have to work out how to live together all the time. I currently spend 90% of my time at Phill's anyway but it will be interesting when that house is both of ours. I try to look at everyone's blogs but it has been going slightly crazy here with the end of term. It should hopefully get better soon! I am a week behind. Fingers crossed for your house! Mmm... That is indeed yummy fabric. What do you intend to stitch on it? Sorry to hear the frogs visited. Good luck on your house. You certainly have a lot going on! Good luck with the house! Your stitching looks great! The fabric is beautiful! Ooo Mangogirl, that fabric is gorgeous! Good luck with the house (and your stitching is looking great, too)! Good luck with the house and hope you get your money sorted. Oh gorgeous fabric and hope all goes well with the house -fingers crossed for you! Good luck with the house ... don't forget a spare room for stitching/crafts should be agreed upon in advance ... most men don't appreciate such space consuming hobbies. I don't know what super is. And any chance for a link to the lady's dyed fabric website - it looks amazing. Great progress on both pieces Caitlan. Love the color of the fabric. And I wish you lots of luck with the house. good luck with the house and I hear you end of term is just crazy but here's to Easter hols. New house, new beginnings - I wish you all the best! Yummy fabbie, Caitlin. :D Stitching looks great!! 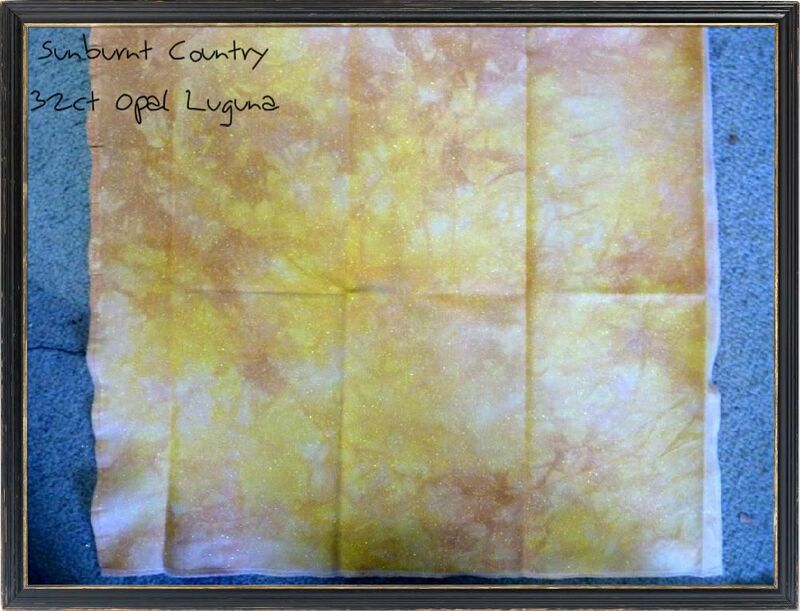 What lovely hand dyed fabric! First of all, your stitching is gorgeous! Secondly, good luck with the house! I know how nerve-wracking it will be and I also know that it's will probably be a lot scarier in your mind than in actuality. I hope everything sorts itself out with your boss situation. Keep us updated!